Why does Cuadrilla own an old gas well near Elswick in Lancashire? The Elswick-1 gas well was completed and stimulated by Independent Energy in 1993. The gas field, which was commissioned in 1996, produces gas from a low permeability sandstone reservoir at a depth of around 4000 ft and is used to generate power which is fed into the electricity grid. It has generated around 1 MW of power from a reciprocating gas engine since 1996. The reason for the gas being used to produce electricity is that it is coming from one isolated gas well far from other oil and gas infrastructure. It would be prohibitively expensive to build a pipeline to feed the gas into the National Transmission System (as it would to compress the gas and tanker it away) and so burning it on site to produce electricity is a much cheaper option. The Elswick-1 was sold to Cuadrilla Resources by Warwick Energy in January 2010 a couple of months after Cuadrilla obtained planning permission to drill a shale gas well at Preese Hall, about 3 km from Elswick-1. The reason for Cuadrilla buying the well is not particularly obvious. Cuadrilla is a small startup company with a limited amount of investment capital which it is burning though at a prodigious rate ($17 million last year alone). Cuadrilla’s main business plan is almost certainly to use its investment capital for exploration, to demonstrate that large profits can be made from shale gas production in the license areas that it owns. At that point the value the company would rise significantly and it is likely that the company would sell out to a much larger player in the industry which has the resources to go into full scale production. It seems odd that Cuadrilla would use some of it’s precious investment capital to buy an old, small-scale electricity generating site that has nothing to do with it’s core business of shale gas exploration. This is until you look at what it has been saying about Elswick recently. In a letter to the Southport Visiter on 11th August Mark Miller CEO of Cuadrilla said ‘our Elswick site has been producing gas since it was hydraulically fractured in 1993 without any inconvenience for the local community’ and in the Formby Times on the 23rd August Cuadrilla are quoted as saying that ‘a site at Elswick had been producing gas since 1993 without any problems’. Cuadrilla’s general PR strategy with respect to Elswick seems to be to imply as close a link as possible between what was done at Elswick and their proposed shale gas development in Lancashire. In doing so they hope to use the fact that Elswick-1 has had minimal impact on the local community there, to weaken resistance to their plans. Their ownership of the Elswick-1 site is very useful in building this link in people’s minds. This is duplicitous in a number of respects. First of all Elswick-1 has almost nothing to do with Cuadrilla. They did not drill the well, build the generating station or operate for most of its lifetime. So drawing any sort of conclusion about what Cuadrilla will do in the future based on what has happened at Elswick before Cuadrilla bought it would be wholly erroneous. Secondly Elswick-1 is a conventional gas well, though one drilled into a quite low permeability sandstone. It is not a shale gas well and that explains why there is only one well needed to produce gas from the whole Elswick field. Shale is an impermeable rock which must be heavily fractured in order for the gas to flow through the rock at all, whereas sandstone is permeable. This is one of the main differences with shale gas. Due to the impermeability of shale rather than being able to drill a single well or a few wells into a field it is necessary to drill large numbers of wells at regular intervals across the field, because the gas is unable to travel large distances through the rock to reach a well. This is why Cuadrilla are talking about ‘400 wells across 40 sites’, hardly the single well that is Elswick-1. This is probably the biggest lie Cuadrilla are telling people. 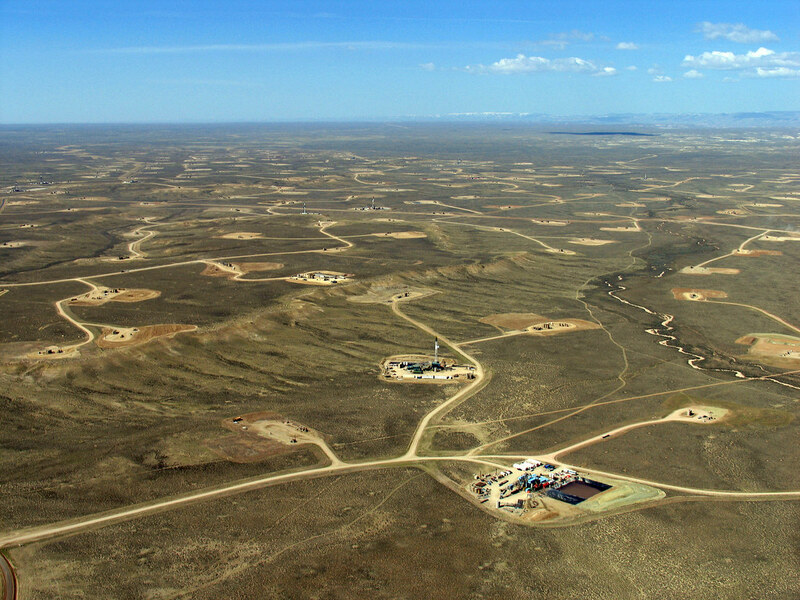 That these are small and inoffensive developments Shale gas extraction has been quietly growing in the western United States for years and while it affected people the low population density meant the number of people complaining wasn’t high. It was only after it moved into the higher population density areas in the east, like Pennsylvania, that opposition to it gained momentum. The population density in the British Isles is much higher than even the eastern United States. Look at this simulated image of what large scale fracking might look like in the British Isles. The image was created by overlaying well pads from the Jonah gas field in Wyoming on to an image of some English countryside. It gives you a rough idea of the sort of industrialisation of the countryside that shale gas development involves. Thirdly while some stimulation was performed in order to increase its productivity after the well was drilled in 1993, allegedly involving hydraulic fracturing according to Cuadrilla, this is not remotely the same as what happen with shale gas exploitation. Elswick-1 is a single vertical conventional well that received a single stimulation treatment just after it was completed. With shale gas development we are looking at 10 horizontal wells going out up to a mile in different directions from the pad, which will under go extensive hydraulic fracturing at regular intervals during the short life of the well. This process will be vastly more complex and intense than anything that might have been done to Elswick-1. The amount of fracking fluid used for instance would be orders of magnitude larger. Fourthly the fate of the gas after it leaves the well is high unlikely to be remotely similar to that at Elswick-1. Pipelines are not used to take the gas away from Elswick-1 because it is a single isolated well but with talk of drilling 400 wells in a relatively small area using pipelines to take that gas away will much more feasible and will likely be the preferred option. This means a further industrialisation of the countryside with a pipeline network, with attendant compressor stations etc., on top of the well pads themselves. So it can be seen how useful ‘our Elswick site’ is for Cuadrilla’s PR machine. For anyone who doesn’t dig into the massive differences between Elswick-1 and what Cuadrilla propose to do to Lancashire, and that is likely to be most people, the implicit link that Cuadrilla is trying to make suggests that their plans are nothing new and will have little effect on the area. The money spent on Elswick-1 should be seen for what it is, part of Cuadrilla’s PR budget aimed at lulling local residents into a false sense of security. This entry was posted in Blog and tagged Cuadrilla, Lancashire, System Failure, North West. Bookmark the permalink.